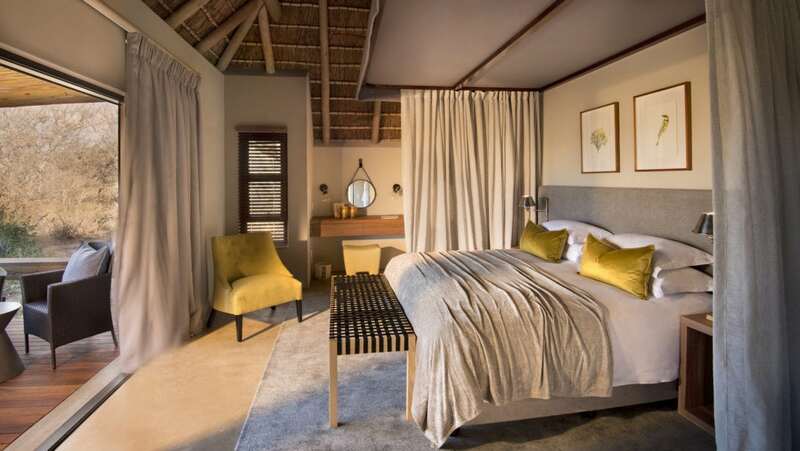 The architect and interior designer of RockFig Safari Lodge were inspired by the Timbavati setting of this luxury South African safari lodge to create a relaxed ambience with indoor and outdoor guest spaces that segue into each other, and enable both communal and private moments suffused with an authentic bush feel. RockFig Safari Lodge features just six chalet-type suites, making it ideal for exclusive-use bookings for families or groups of friends. The sense of place comes through strongly, with the colour palette in each room inspired by the purple and green hues of local birds and plants. 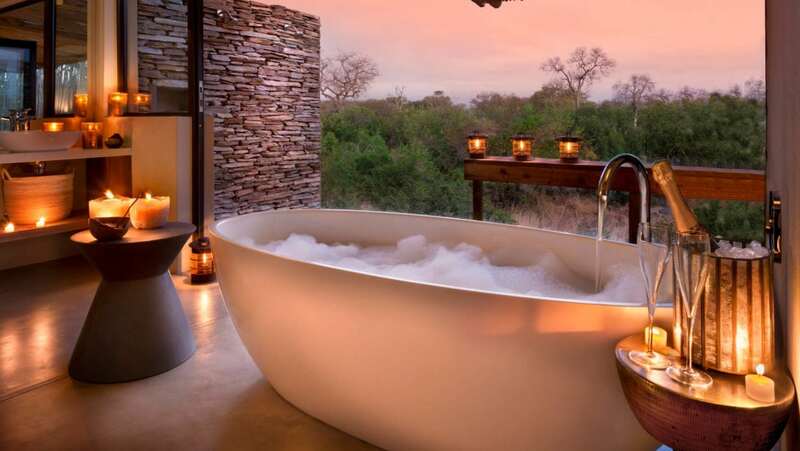 Although guests are always conscious of where they are, no stone is left unturned in the quest for comfort and luxury, with each suite featuring both indoor and outdoor showers, a private verandah ideal for romantic candlelit dinners, a minibar and a bath. Specially commissioned watercolour paintings add notes of cool beauty, and – as with every space in the lodge – the aim is always to delight the guests who’ll stay here. 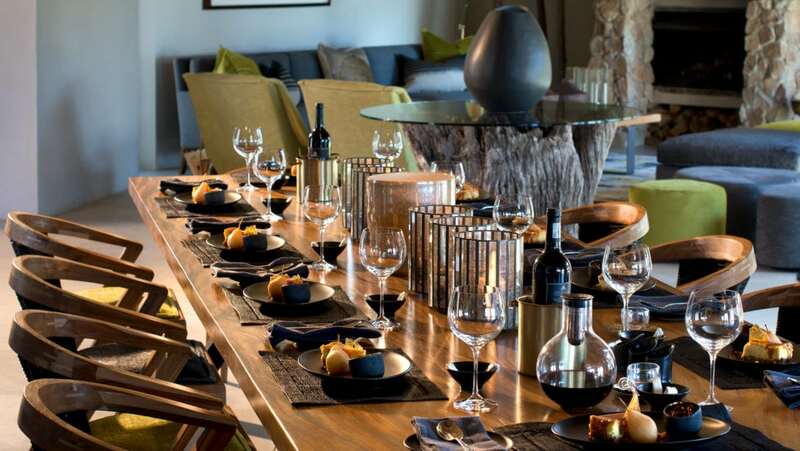 There’s a thoughtfulness to the decor, with the emphasis being on the guest experience – but also an unmissable sense that it’s the natural beauty of the Timbavati bushveld that’s the true hero. 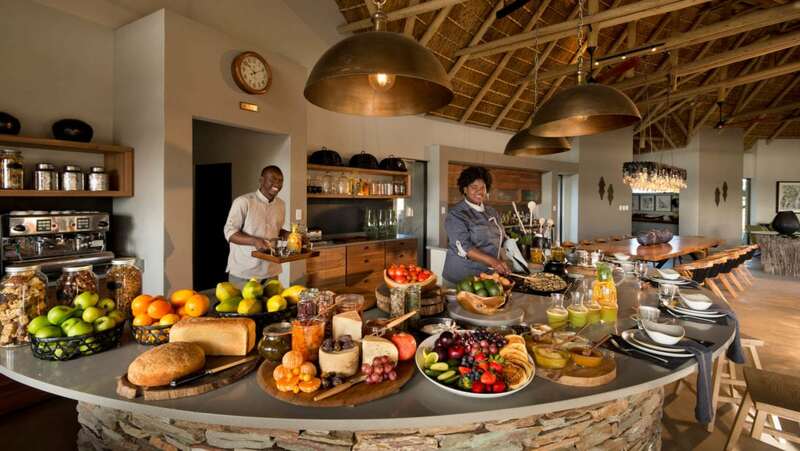 Spending time in Timbavati is always a nourishing experience, and this is reflected in the layout of the indoor guest areas at RockFig Safari Lodge, just as much as in the menus with their emphasis on locally grown ingredients. The open-plan kitchen is a favourite with younger guests, who love to sit at the counter and watch their meals being prepared, while it’s hard to resist the pull of the fireplace in the lounge on a winter’s evening. Subtle touches of opulence are throughout, including the dreamy chandelier that hangs over the impressive, 4m-long table, which is perfect for shared meals and safari stories. 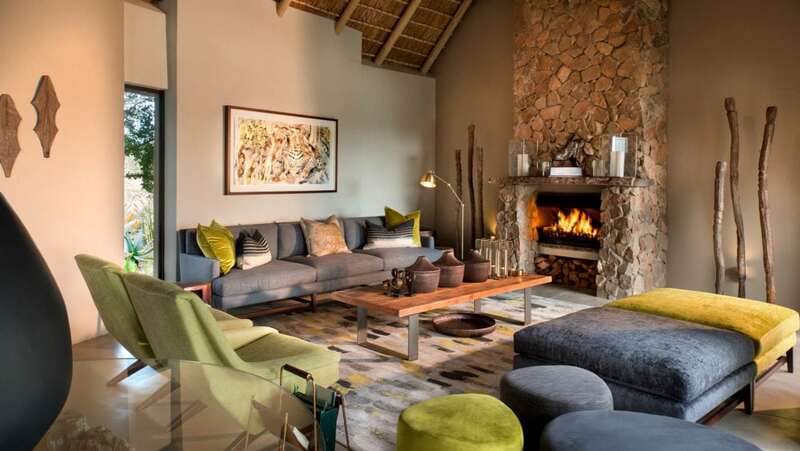 Many of the pieces of furniture in the lodge were commissioned from local artisans, while the colours take inspiration from the Rockfig tree and the area’s lovely lichen-spotted rocks. 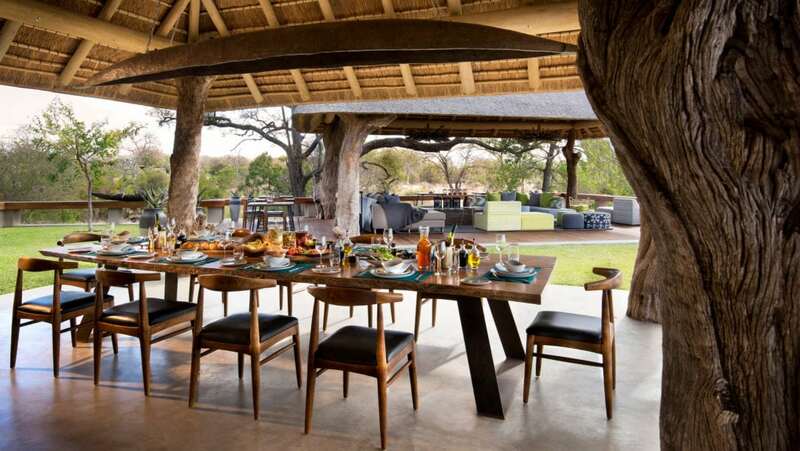 A second, long dining table can be found outside, where you can feel the energy flowing in from the surrounding bush … a vibrancy which in turn is reciprocated by the warmth and hospitality of the RockFig Safari Lodge staff. 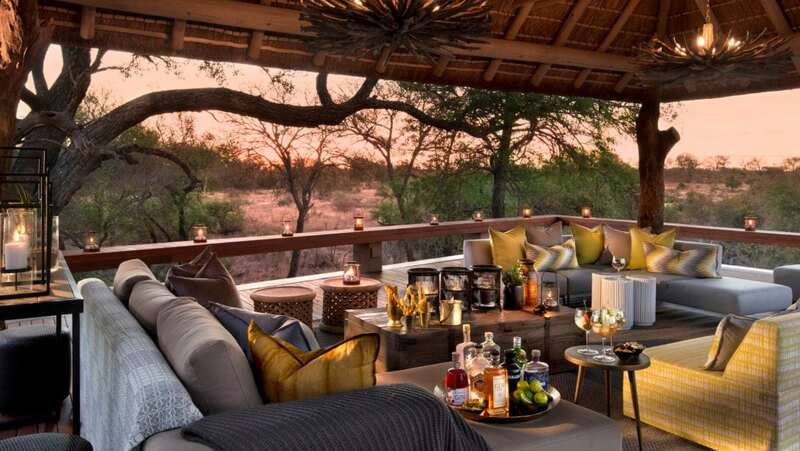 The undoubted outdoor centrepiece is the comfortable covered lounge with its arresting views, although the pool deck, overlooking the waterhole, is just as inviting. 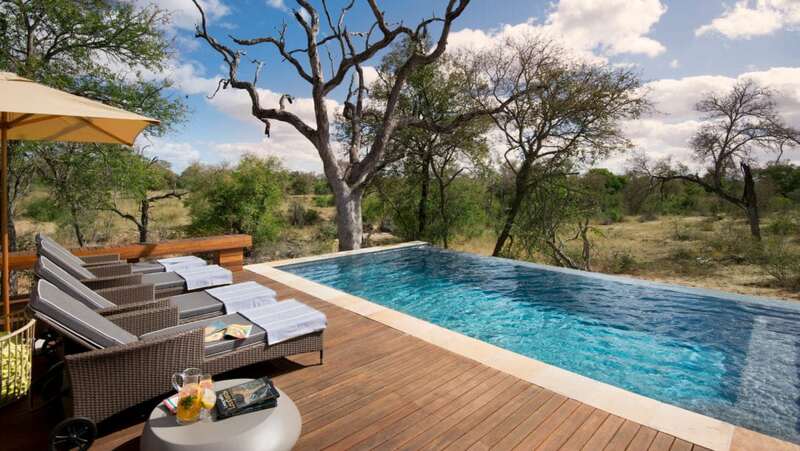 A dip into the pool perfectly symbolises the feeling of being immersed in the rhythms of Timbavati, while its surrounding loungers are responsible for a perfectly relaxed afternoon, perhaps punctuated by pizza from the outdoor oven. The boma area becomes the focal point on starry nights, as the crackles of the firewood compete with the cackles of hyaenas and the hushed, happy whispers of guests. 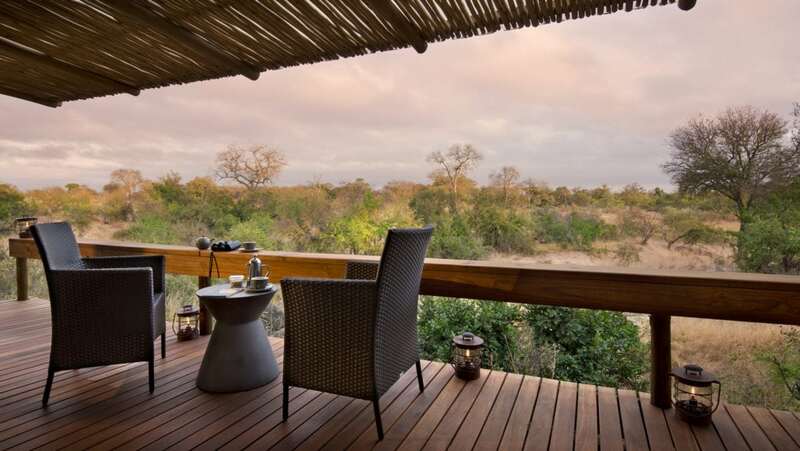 Stepping outside at RockFig brings you even closer to the bush, without ever feeling that you’ve left the comforts of your new home-from-home behind.